We were heading out to visit the dolphins and I found a quiet place at the front of the boat. I went within myself and opened my mind to dolphins. After a while I began getting a visual image of two pink hearts that were intertwined. Then the two hearts expanded into an entire mandala of pink hearts. It was beautiful and it felt as if the dolphins gave me this image. I felt my heart open as I concentrated on it. After the meditation ended I rejoined the group and we continued on and on….no dolphins for a very long time. And when we found them, they were in very murky, green water. After easing into the water I noticed my mask was leaking profusely…to the point where it was filling completely with water even though I cleared it. I couldn’t see my camera readouts so I exited the water. The camera went to a safe place, the mask got fixed and I entered the water again with the only intention of opening to an encounter with dolphins…nothing more. No photographs, no swimming hard to keep up. I simply invited the dolphins to join me and asked if I could join them and kept the image of the pink heart mandala in my mind. I swam away from the main group of humans and found myself suddenly surrounded by mother spotted dolphins and their babies. One mom and calf…another mom and calf…another mom and calf. I had three mothers and their babies surrounding me, more beneath me and when I glanced back still more were coming. There was a minimum of 16 spotted dolphins surrounding me and possibly as many as 20. 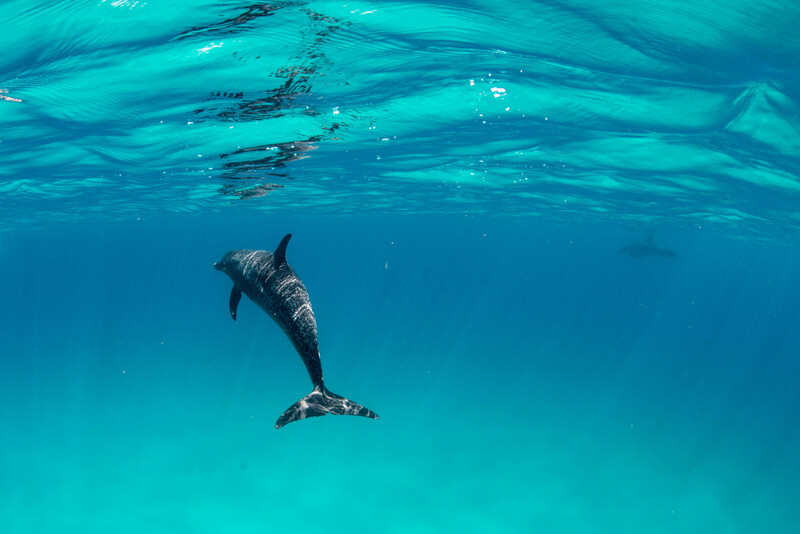 As I gently swam side-by-side with the dolphins I was overcome with emotion….I could scarcely believe I was welcomed into the pod of dolphins who glided beside me as if I was one them. I wept profusely as I gently swam within arm’s reach of the largest female and her calf. And all the while the mandala of pink hearts remained in my mind. I became one of the pod today as I surrendered to the gentle flow of love permeating everything around me….and within me. I felt welcomed back into my family, a lineage of wisdom that is indescribable. It was as if I was welcomed home. Not in a geographical sense but rather a home within my heart and mind. Lately I have had the feeling of coming full circle in my life, as if I’ve completed a very long and arduous journey to reach a place of completion that will give rise to a new beginning. Many years ago dolphins called me into this life and now they have helped me find a new beginning point. Call me crazy, it doesn’t matter. I am home within myself and all is well. Oh, yes……all is well. Later I got out my camera and captured one photo from the day…and it was enough.